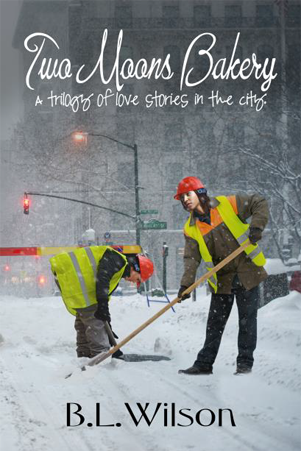 Two Moons Bakery is a trilogy of novellas about relationships among African-American lesbians, their friends, and family who live in NYC. The three stories interconnect through a central meeting place called Two Moons Bakery. Terry Samson and Essie Brooks are the co-owners of the bakery. In the first novella, entitled MAYDEANE, a middle-aged, conservative businesswoman, Sylvia Royce, must learn to accept the love of a younger woman, Fredericka Hicks, who drives cabs for a living. MAYDEANE also touches on a problem baby boomers face: to put an aging parent with Alzheimer’s into a nursing housing or not. The second story, LEGS, introduces the reader to an unlikely pairing. Somebody’s been whistling at Delaney Peters, an ER doctor, for the last five days precisely at 7 AM. When she confronts a worker in the manhole, she discovers it’s female electrician, Andrea Joiner. They meet again in the ER when Delaney treats Andrea’s eyes for chemical burns from an electrical fire in the manhole where she works. In the third novella, WORKSPACES, Janelle Montgomery is a geriatric psychiatrist who works from her home. She wants customized shelves built similar to the ones in Two Moons to hold her never-ending paperwork. Terry refers Janelle to her friend, carpenter Caitlin Robbins. Caitlin’s confession of her guilt-ridden behavior with a younger woman provides Janelle with the opportunity to find out more about the quiet, self-contained carpenter. Things heat up when Caitlin, a die-hard single widower, admits her feelings for Janelle and finally acts on them. Two Moons Bakery, is available for pre-order 3/23/16 on Kindle. The release date is 4/2/17.